It is kind of like putting in your high-paid relief pitcher at the critical moment. Stu Sternberg is not one to throw money around casually, especially large sums of money. Sternberg and the Rays have contributed heavily to the Rick Kriseman re-election campaign. The Rays have also donated $50,000 to the Kriseman Political Action Committee, Sunrise Pac. Sternberg is not making this kind of investment in Rick Kriseman out deep sense of civic pride. Kriseman wrangled the deal to let the Rays look for a stadium site outside of St. Petersburg and as those efforts lead to a new site, the negotiations with St. Petersburg for the Ray’s exit will fall in the next mayor’s term. If they didn’t “prefer” to negotiate with Kriseman, then they would likely be contributing to the Baker campaign. However, they have had experience with Rick Baker whose background as a merger and acquisition's attorney is all about negotiations. Baker is the last person they want to see across the negotiation table because he will not owe the Rays anything and will be working strictly for St. Petersburg. This seems to be a blatant attempt to buy some strong influence up on the second floor of City Hall. In case you are naive enough to think Kriseman does not pay back those who support him just look at his list of cronies currently languishing in City Hall. And if you think, he does not retaliate against those who don’t support him consider this: Charlie Frago, Tampa Bay Times Staff Writer, Black entrepreneur says city stiffing him on project after he endorsed Rick Baker. Ask yourself this question, who do you want to negotiate the fate of the largest and most desirable piece of redevelopment property in St. Petersburg? Who do you want to look after your interests? 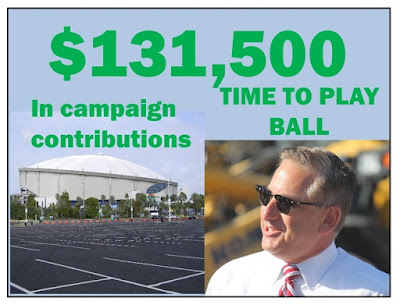 The guy who the Rays just paid almost $200,000 to get reelected, Rick Kriseman, or the guy with real negotiating skills and no debt to pay back, Rick Baker. The City and the taxpayers of St. Petersburg can get really screwed over on the stadium deal and the Tropicana field property. We saw what Kriseman did on the Pier. We experienced his lies on the sewage crisis. We saw him pay off his cronies with high-paying jobs. Do you really want him selling you out on the stadium? Rick Baker is by far the better choice. You mean I should support Rick Baker the TRUMP CHUMP? HAHAHAHAHAHAHAHA Not happening!